You can order our highly demanded 4x6" table tents for real estate business to give your customers a quick glance at what you have to offer them. Table tents are a great way to show that you are valuing your customer's time; by keeping your product and services in front of the clients at all times when they are in your store, they don’t have to wait for a menu or price list to be brought to them. 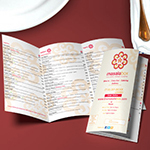 Order your 4x6" table tents for restaurants today! 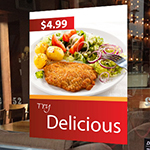 Table tents will help advertise your restaurants, bars and establishment by letting your patrons know what the featured specials are. For conference events, the custom 4x6" table tents for event highlights help create an attractive table placement card to provide event agenda highlights. Hotel owners can use our standard 4x6 table tents for room service menus to advertise special services, points of interest around the city and even promote the establishment itself. 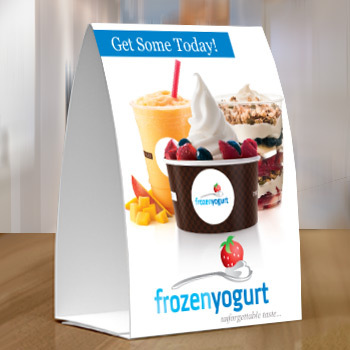 With full-color printed table tents, keep your audience and customers engaged with your products and services. 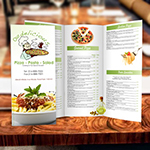 With our restaurant menu printing you can show all the items you serve, what they look like, and how much they are. It's crucial that you find the perfect materials that will fit your budget effectively and grant you the market exposure you desire. For an easy start, why don't you consider Table Tent Printing? Order our 4x6" table tents for coffee shop and let your customers know the special offers you have for the month. Table Tents are a very simple material but will give you great results if done well. The printing and color will be on the outside of the table tents. 14 pt uncoated cover is also known as cover stock, or the short name cover. Heavyweight papers are called cards stock. The thickness of card stock is measured with point sizes such as 14pt and 16pt or with pounds (lp) such as 110lb, 120lb and 130lb. This is a heavy duty stock with "ultimate" shine that features a fade-resistant UV coating that gives more protection to the card. UV coating is applied as separate finishing. 1. Know your target audience. It's one thing to know who your target customers are and another to know where they are and what their needs are. Whatever kind of product or service you offer, it is important that you are familiar with the needs and wants of your customers. You need to know their capacity to buy, their lifestyle, hobbies, and values. 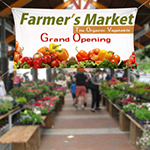 Knowing this information will help you create the best table tent that will appeal to your target audience. 2. Get Artistic: The best way to get remembered is to make your table tents look as creative as possible. This is where your artistic talent will come in good use. You can always look at templates for design ideas or check out the table tents of your competitions to get inspiration. But remember never to copy the design of other businesses. After all, how can you stand out when you don't create your own design? 3. Put a strong call to action. You should not only inform your customers and prospects of the products or services you offer; you also need to sell to them. Tell them what they need to do in order to take advantage of your offers. Be creative as possible so you are able to generate immediate response. Also, present exciting and irresistible offers so you can get response right away. It will help if you include coupon codes so you can effectively track the result of your campaign. Our Table Tent Cards are bringing in the business. Thank you for the quick turnaround time! Thank you for the table tents. They look great on our restaurant's impression! Had a fantastic job done on our custom order. Pretty pleased with the work done! Printing Xpert stands behind the quality of its products. If you are not completely satisfied with the quality of the products, please contact Customer Service within 14 days of receipt of your order. Please note that Printing Xpert cannot be responsible for design errors, spelling or image selections that are a result of the design process. Can you create a design for my full color printing? Yes, we have professionals that can create unique and stunning designs for an additional fee. 4/0 = Full color cover (outside) and iniside remain blank. 14. pt Card Stock is heavyweight paper. The thickness of card stock is measured with point sizes such as 14pt and 16pt or with pounds (lp) such as 110lb, 120lb and 130lb.